ForceField security doors and window screens have passed every imaginable test. The Australian Standard for construction of homes in bushfire prone zones (AS 3959) simply states that openable windows must be screened with corrosion-resistant steel, bronze or aluminium mesh with an opening of less than 2 mm x 2 mm. Consequently most security screens with stainless steel mesh can be used in bushfire prone areas. That doesn’t mean that they are all equally good. We decided to put ForceField to the test. Prowler Proof asked CSIRO to expose a ForceField® window screen to a radiant heat flux level of 60 kw/m2 for a minimum of 60 minutes. Most bushfires will create heat levels of around 40 kw/m2 and will pass within minutes. View video. After 91 minutes the window screen was still in position and it was decided to terminate the test. Throughout the test the heat level measured one metre behind the unexposed face of the window screen was approximately 10% of the level measured at the exposed face of the window screen. 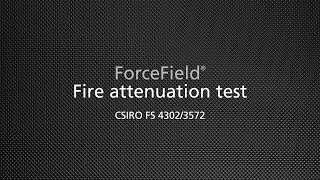 Even during a bushfire ForceField® will protect you. It will not only stay in place. Just one metre inside your home, the heat will be reduced by approximately 90% compared to the heat outside at the surface of the screen.